The Weminuche Wilderness is a wilderness area in southwest Colorado managed by the United States Forest Service as part of the San Juan National Forest on the west side of the Continental Divide and the Rio Grande National Forest on the east side of the divide. It is about 5 miles (8.0 km) south east of the town of Silverton and about 15 miles (24 km) northeast of Durango. 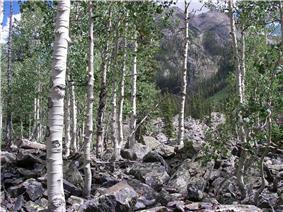 At 488,210 acres (1,975.7 km2), it is the largest wilderness area in the state of Colorado. Within the wilderness can be found three fourteeners of the San Juan Mountains; Mount Eolus, Sunlight Peak and Windom Peak, in addition to numerous thirteeners and other peaks of note. 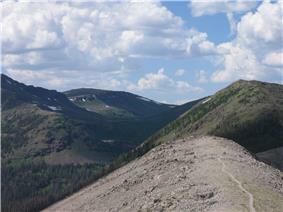 Looking north on the Continental Divide Trail between the Palisade Meadows cutoff and the Knife Edge. 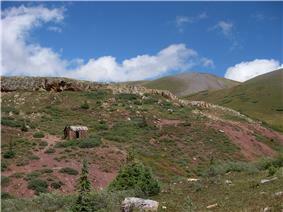 Abandoned mine shack near the Continental Divide Trail. Grassy hills near Lemon Reservoir. ^ "Weminuche Wilderness". 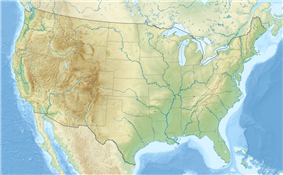 U.S. Forest Service. Retrieved August 7, 2012. ^ "Weminuche Wilderness". Wilderness.net. Retrieved August 7, 2012.